Do you have an outdated tub that you never use? Have you contemplated replacing it with something better, but don’t want to go through the frustrating process of having your home life disrupted with a remodel that takes weeks or months? If so, consider having West Shore Home convert your old tub into a beautiful, easy-access shower that will give your bathroom new life in just one day. Our team of dedicated and experienced installers will convert your bathtub into the shower you’ve always wanted, saving you the time and trouble of undergoing a full remodel and allowing you to enjoy a more practical bathing area right away. Infused with antimicrobial protection and made from an acrylic material that resists cracking, chipping, mold and mildew growth, our replacement showers are easy to maintain and designed to withstand the test of time. By simply wiping down the nonporous surfaces, you can keep your new shower clean and sparkling. Plus, you can choose from a number of customizable options and accessories, including colors, textures, tile patterns, soap dishes, seating, and much more. Just pick what’s right for you and our certified installers will have it ready for you in just one day. Our showers are made of durable acrylic that resists wear and tear, so your new shower will look new for decades with minimal maintenance. Eliminate the need for stepping over a high wall to enter the bathing area. With our low- and no-threshold options, getting in and out of the shower has never been easier. Our showers and wall surrounds are infused with an antimicrobial agent that prevents bacteria from growing and reproducing, ensuring your new shower surfaces stay fresh and clean. 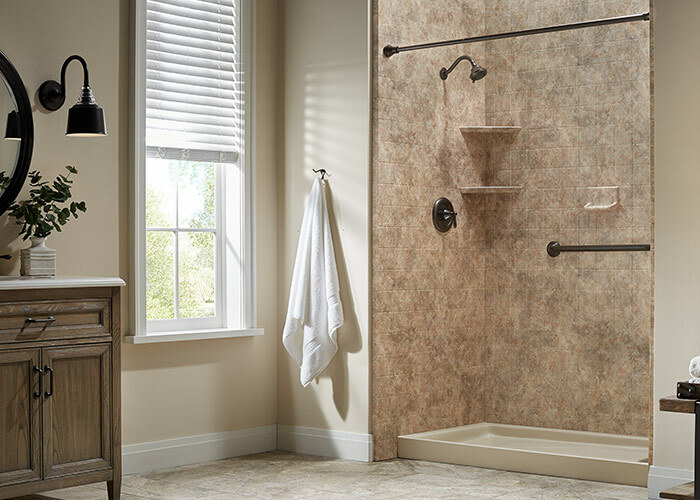 Because there’s no grout to scrub and our products are mold, mildew, and crack resistant, cleaning your new shower is a breeze. By simply wiping the nonporous surfaces, you can effortlessly maintain a clean bathing area.